The Ramallah Municipality, as part of its implementation of the street naming and numbering project, and to complement the project, issued the Ramallah tourism map, where the most important sites in the city were identified on the map. These sites include: governmental institutions, non-governmental organizations, consulates, diplomatic missions, international institutions, Ramallah Municipality facilities, hospitals, medical centers, public squares, water springs, mosques, churches, police stations, schools, restaurants, hotels and banks. 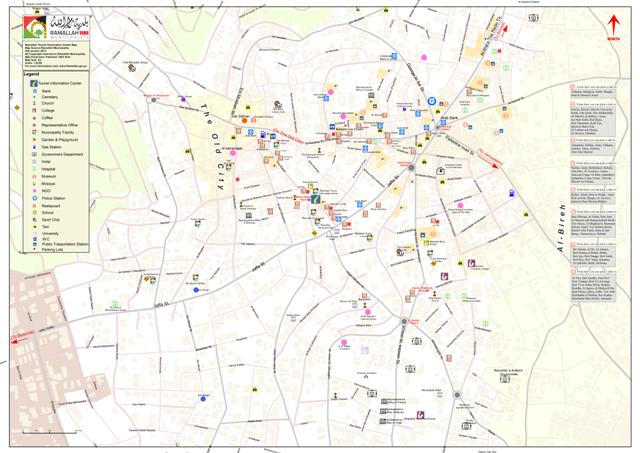 You can obtain a map from the Ramallah Center for Tourist Information.